One of last week’s installations was of an Allen Bravura L-5 containing Classic Allen, English, Baroque and French voicings, supplied with an Allen MIDI Assistant along with 500 pre-loaded hymns and voluntaries. This church in Sunderland had been looking for a suitable instrument, which they could use with or without an organist, to replace their existing organ which was well past its prime. We were very pleased to be able to help them! 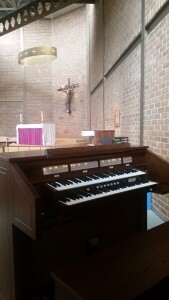 We also supplied a pre-owned Allen organ to St. Benedict’s Roman Catholic Church in Easterhouse, Glasgow. This organ is an early Allen digital instrument, more than 40 years old and still going strong with all parts still available. With two reconditioned speaker cabinets and a full warranty, this organ will service the church well for many years to come. It was played for a service only 30 minutes following the completion of its installation!